Sometimes it's the simplest ideas, executed well, that work. 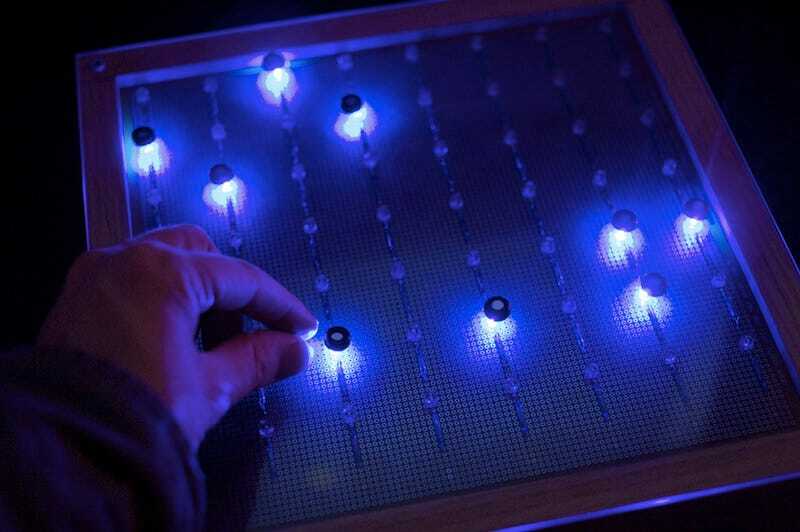 At ITP, this controller interface by John Kuiphoff uses magnets placed on a grid to control a Bloom-like synthesizer, play games, and more. It's called the ReedBox (named for the magnetic reed switches it employs), and it drives a number of different Processing "sketches" (little apps), which is the same software used to make many of the projects we saw on IAC's 120-foot screen last week. The one you see here is inspired by one of our favorite iPhone apps, Brian Eno and Peter Chilvers's Bloom—musical notes dependent on which grid points you place your magnets on loop and can be changed in real time.